After Japan bombed Pearl Harbor, President Roosevelt signed an executive order that forced more than 120,000 Japanese Americans into primitive camps for the rest of war. Their only crime: looking like the enemy. 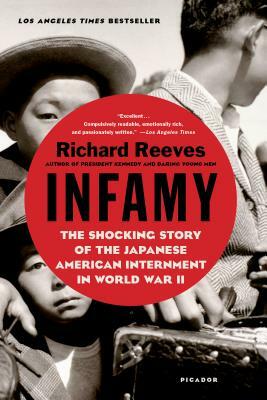 In Infamy, acclaimed historian Richard Reeves delivers a sweeping narrative of this atrocity. Men we usually consider heroes—FDR, Earl Warren, Edward R. Murrow—were in this case villains. We also learn of internees who joined the military to fight for the country that had imprisoned their families, even as others fought for their rights all the way to the Supreme Court. The heart of the book, however, tells the poignant stories of those who endured years in “war relocation camps,” many of whom suffered this injustice with remarkable grace. Racism and war hysteria led to one of the darkest episodes in American history. But by recovering the past, Infamy has given voice to those who ultimately helped the nation better understand the true meaning of patriotism. Richard Reeves, the bestselling author of such books as President Kennedy: Profile in Power, is an award-winning journalist who has worked for The New York Times, written for The New Yorker, and served as chief correspondent for Frontline on PBS. Currently the senior lecturer at the Annenberg School for Communication and Journalism at the University of Southern California, he lives in Los Angeles.